As a base or support for a work of art, GFRC pedestals from Stromberg are available in lots of sizes, shapes, colors and textures. 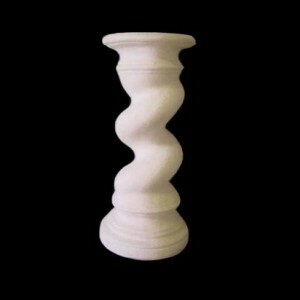 These durable pedestals are the ideal way to display your works of art, your plants, or your vases. Wherever you need a light, strong, attractive and fire retardant material, GFRC is an excellent option. Glass fiber reinforced concrete pedestals by Stromberg are lightweight, resilient and have no unsightly seams. Choose one of Stromberg’s stock GFRC pedestals or work with them to have one designed especially for you. Anywhere you place them in your home or place of business; they’ll make a grand impression. Stromberg GFRC pedestals can be used for interior or exterior design, in commercial, hospitality and residential areas. These splendid architectural décor pieces can be created in different heights and textures that mimic natural stone, as well as in a variety of finishes and colors. Patterns to choose from include swirled, animal motifs, column inspired, classical, asymmetrical and geometric. Stromberg GFRC pedestals are of superior quality and value. Their designs incorporate their unique design approach and 30 years of experience working with GFRC, their most popular product. Enhance your home or garden environment with these functional, multi-use pieces crafted in GFRC; they’re beautiful and they’ll last for generations. GFRC is one of the most durable materials you’ll find. High strength glass fiber is embedded into a cementitious matrix; it’s the glass fibers that give GFRC its incredible strength and durability. GFRC is not prone to environmental damage; it won’t crack or corrode and insects can’t invade it. Glass Fiber Reinforced Concrete weighs much less than precast concrete, making its installation faster and easier. Its lightweight quality also means your shipping costs will be reduced. GFRC pedestals can be made to resemble several different textures and can even have a smooth surface that can be painted. GFRC can be cast into almost any shape, so your design options are greatly increased. Bring your ideas to Stromberg and prepare to be amazed. GFRC is a completely green product; it’s made from recycled materials and has a very low environmental impact. At Stromberg Architectural, you can be assured of a partnership that offers you creative collaboration on all of your GFRC pedestal ideas. Prepare to be amazed. Quotes and initial consultations are at no charge, and you’ll appreciate their excellent customer service and fast shipment. Contact them today at 903-454-0904 for your free custom quote, or email them.